FIRST, the girls. Think of Ana Ivanovic. She’s attractive, brunette, graceful, long-legged, was the former world No.1 and, in this tournament shown on SkyCable channel 33 (Balls), she’s the defending French Open champion. Be honest: When you scan through the TV channels and, even though you’re not a tennis buff, happen to watch Ms. Ivanovic playing, don’t you put the remote control down then gaze and ogle at her beauty? Yes you do. Yes I do. Yes we all do. How about the most famous woman athlete in the world? Do you know her? Her given name is Maria and, standing 6-foot-1 with long, flowing blonde hair and a pair of glittering earrings that dance by her side, don’t you watch her, too? Yes you do. Yes we all do. Consider what happened four nights ago at the birthday party of my buddy, Michael Jerome Templado Limpag. In the middle of drinking San Mig Light, Michael Jerome and I left the other partygoers to rivet our eyes on Ms. Sharapova. Isn’t she gorgeous? Those light green eyes mesmerizing? Her elegance stunning and body statuesque? Yes, yes, yes… yes! For this is one of the most distinctive features of tennis—a trait that other sports don’t offer: Women are celebrated. They’re sought-after. The women are watched and followed. What other sport, I ask, does the same? Where the women are co-equals—in prize money, in coverage, in popularity—with the men? None. Except tennis. Golf? Visit the Cebu Country Club today, do a survey and ask if, apart from world no.1 Lorena Ochao, anybody is familiar with the world’s nos. 2 to 5 players, namely, Yani Tseng, Paula Creamer, Cristie Kerr and Jiyai Shin. My guess is few, if any. Unlike Maria and Ana. SECOND, tennis has plenty of surfaces. Today, it’s the red clay of Roland Garros, the home of the tennis Grand Slam event in Paris, France. This tennis flooring is, often, boring. Games slow. Socks are dirtied. Players slide. That’s red clay. Next month, it’s Wimbledon. There, it’s color green. There, it’s slippery and fast. It’s grass. The month after that, in August, tennis shifts to one other surface: the DecoTurf brand of hard-court of the US Open in New York. 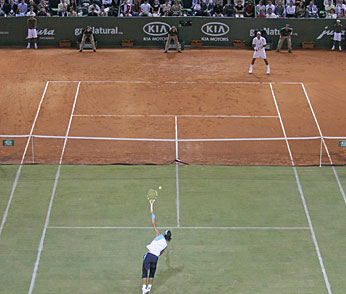 Imagine, in a short span of 100 days, these athletes having to adjust from red clay to green grass to blue hard-court? It’s intricate and puzzling. It’s tennis. Is it the same with, say, basketball? Granted, in the current NBA playoffs, the venues hop from the Quicken Loans Arena to the Amway Arena to the Staples Center to the Pepsi Center… but the surface? It’s the same, same, same hardwood. THIRD, in this sport, the mantra is as follows: You Are Alone. You are. You may have a coach/dad at home, you may have a trainer named Nick Bolletieri at the academy—but, when you enter that tennis court and face another opponent, You Are Alone. Pete Sampras once explained it this way: “It’s one-on-one out there, man. There ain’t no hiding. I can’t pass the ball.” True. I don’t know of another sport—where you play, like in the French Open, for up to 4 or 5 hours—where a single word from a coach is disallowed. In fact, it’s not only not allowed, you’ll get disqualified. Kicked out. Told “goodbye” if you’re coached. Only in tennis. Boxing is one-on-one but Manny’s got Freddie. Kobe, the winner yesterday, has Phil. The Champions League winners have the brilliant 38-year-old Josep “Pep” Guardiola. Tennis? You’re all alone, baby. It means that you can’t be babied. Even if you’re a 16-year-old, you’ve got to stand on your own two legs, swat that Babolat racket by your lonesome, cry alone if you have to after a loss. FINALLY, just two names: Rafa and Roger. Catch R & R, plus Ana and Maria and Novak and Andy M. and Serena during the French Open, shown “live” each night from 5pm onwards…..